Oil and gas companies are relying more heavily on automation and control technologies to increase productivity, reduce costs and improve their safety standards. By remote monitoring and control technologies companies are able to prevent hazardous situations and improve their health and safety standards. Automation and control systems are used throughout the industry from oil & gas field operations, to production and processing plants, and distribution and retailing of petroleum products, helping to raise efficiency, speed and performance of companies’ operations. With the aid of control, automation and monitoring technologies companies can monitor and report their activities with greater transparency and therefore improve processes and safety. Within the Oil & Gas Industry there are various applications which require to measure flow of liquids such as oil, hydrocarbons or produced water. Oil platform operators for example have to ensure that they are adhering to the directives of oil discharge guidelines. They therefore have to find a way to reliably and accurately monitor the platforms’ discharges such as produced water. These circumstances lead to the situation that flowmeters often have not been installed on pipelines where monitoring was originally not necessary. In this case, instruments which can subsequently be installed to pipes of various materials and diameters without the need to interrupt ongoing processes are in high demand. On critical oil and gas processes, Flow Technology’s flow measurement systems meet— and exceed — the highest expectations. With proven reliability, superior accuracy and virtually maintenance-free service, they provide unsurpassed total performance. Our rugged positive displacement Flowmeters and precision turbine flowmeters are used to monitor the flow of chemicals critical to maintaining production from offshore oil wells. Indeed, Flow Technology Flowmeters routinely perform under conditions that most flowmeters wouldn’t even dare to attempt..
developed to meet the demanding requirements of deep water flow measurement applications. The BL Series’ compact, “boltless” pressure vessel design eliminates the need for high-strength fasteners, and provides utmost reliability. 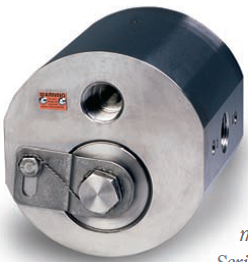 In addition, the flowmeter’s bearingless configuration ensures long life. Specifically designed for use in low flow applications in the oil and gas industry, our TrickleMeter® measures flow rates from 0.005 to 0.5 GPM. This innovative meter, which is able to withstand pressures up to 15,000 psig, features a stainless steel case and carbide shafts. Flow Technology is recognized throughout the oil and gas industry for its ability to develop custom flow measurement systems which meet specialized application requirements. 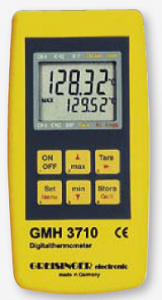 For example, a “high shock” design was developed for installations such as monitoring BOP activation where the meter may be subjected to extreme hydraulic shock loading. This design enables the turbine meter to withstand the water hammer effect without sustaining damage. Various other mechanical configurations, including manifold housings and meters with SAE Code 62 end fittings, have been utilized as the applications require. Several different electronic packages have been developed for use in both surface and subsea applications. Watertight packages are available to house a standard pick-off with a low level output, an amplified pick-off with a square-wave pulse output, and linearizing electronics that provide a linear output of ±0.1% throughout the 100:1 dynamic range of the meter with a frequency and analog output. These subsea packages also have the flexibility to utilize various connector brands, such as SeaCon, D.G. O’Brien, or a connector manufacture as specified by the end user. Flow Technology’s EL500 Series electromagnetic flow meters proved to be an ideal answer to the customer’s demanding water treatment requirements. These meters allow accurate flow measurement in small line sizes with very low flow rates, and with no moving parts, provide reliable operation. MC106B panel-mount transmitters were selected to complement the EL500 meters. These economical transmitters can be integrally or remotely mounted to the flow meter, with the added capability of programming through faceplate push buttons. A total of four EL500 flow meters and MC106B transmitters were employed for each mobile system to measure input and processed water at different stages of treatment. The EL500 meters offered key advantages such as: wide flow range, low pressure drop, chemically-inert Teflon liner, and 316 SS fittings and electrodes. The meters have a nonobstructed flow path with no moving parts, resulting in virtually no pressure drop and long service life. The MC106B transmitters offered the convenience of a panel-mount design, and provided the display and flow signals required during the water treatment process. 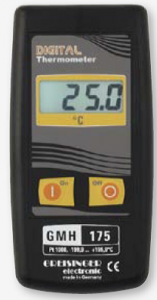 Probe and device are calibrated together, resulting in an error of about 0.1 °C ±1 digit in range 0 to 100 deg C.
Probe: All probes are permanently connected to device. GTH 175 PT-E Probe (V4A, Ø 3 mm x 100 mm) as above, but additional slim insertion tip for all soft media. Handle and cable are resistant to temperatures up to 100 °C. GTH 175 PT-K Probe (V4A, Ø 3 mm x 100 mm) as above, but with Teflon handle and 1 m Teflon cable. Handle and cable are resistant to air temperatures up to 250 °C. GTH 175 PT-G Probe (V4A, Ø 1.5 mm x 100 mm) as above, but with Teflon handle and 1 m Teflon cable. Handle and cable are resistant to air temperatures up to 250 °C. adapter GRS 3100 or GRS 3105 resp. USB 3100 N (p.r.t. accessories). Probe connection: standard flat-pin plug (free of thermo-voltage) suitable for all NiCr-Ni (type K) – probes. 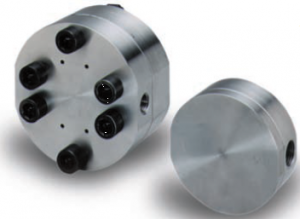 Probe is not included in scope of supply – optimum probe to be ordered separately depending on desired application! Power supply: 9 V battery type IEC 6F22 (included). Dimensions: GTH …: approx. 106 x 67 x 30 mm (H x W x D). impact resistant ABS plastic housing. Dimensions: GMH …: approx. 142 x 71 x 26 mm (H x W x D). impact resistant ABS plastic housing, front side IP65, integrated pop-up clip for table top or suspended use. Probe connection: standard flat-pin plug (free of thermo-voltage) suitable for all NiCr-Ni (type K) – probes. Power supply: 9 V-Batterie Type IEC 6F22 (included).